Two years ago, most of you moved from the 5th & 6th grade class to the Sadie Perry Room for 7th & 8th grade Church School. For two years, your teachers told me the same thing over and over again: These kids can be a handful sometimes, but they are also pretty funny and they actually really smart. This year, I finally understood what they were talking about. Whether we were sharing a meal together, getting to know one another through silly icebreaker games, learning about the bible, the Christian faith and our church, debating over who was going to offer the prayer before dinner, worshiping together, wrestling with challenging questions, asking one another to hold our loved ones in prayer, leading worship together or acting out the entire Book of Genesis with props from the Children’s Day photo booth, suffice is to say we covered a lot of ground this year. You all showed your wisdom, your wit, your humor and your thoughtfulness. I can honestly say that I never sat through one of our confirmation classes without laughing hysterically at some point at something one of you said or did. But I can also even more honestly say that I never left one of our confirmation classes without feeling inspired, hopeful and truly grateful for the opportunity to be able to walk with you all on your journeys of faith. Today you are being confirmed. This means you will confirm the baptismal vows that people took on your behalf when you were younger. This means you will state publically – in front of God and your church family – that you want to stick around and see how this whole faith thing can work in your life. This means you know in your heart that while you are not perfect, that God’s love is more powerful than your imperfections and that God’s grace will transform you in incredible ways. This means that you are ready to listen to who and where and what God is calling you to be – and that you are ready to take the next step on your journey of faith. I am so looking forward to seeing where each of your journeys will take you. You are smart, talented, funny, caring and thoughtful. You are athletes, you are musicians and you are writers. You work with technology and you work with your hands. You show compassion towards your friends and your families and with one another. As members of this church, you each will bring something so unique and so special to this community that we all love so much. So before you make this commitment, I have one thing to ask of you: Don’t go anywhere. Please. Stick around and see what it is like to be an active part of this community. Allow God to transform your gifts and your talents into powerful ministries in this church. I know you all are very busy. This is probably the first time since the beginning of the year that all nine of you are actually together. You are very involved in school activities, sports and community programs. You balance more activities and face more pressure than most of the adults sitting around you today. I love hearing about those activities and am so proud of the ways that you are fulfilled and thriving in different parts of your lives. But this church needs you. We – the members of the Rehoboth Congregational Church – all need you. We need your minds, your passions and your talents. We need your faith and your questions and your sense of humor. We need your new ideas and your innovation. We need you to stick around and figure out what God is calling us to do together. So stick around. Do not come to this church because your parents are making you; come to this church because God is calling you to. Come to this church because this is where your friends are, where your church family is. Come to this church because this church is stronger and more faithful with you than it is without you. Come to this church to help you find balance in your life, to be free from the pressures of the outside world and so that you can be reminded week after week that you are a blessed and loved child of God. Come to this church and be part of this community. We are not perfect. We do not have all the answers. But we do the best we can to dwell in God’s love, to love and support one another and to practice the Good News of the resurrection both inside the walls of our church and outside in the community. So on behalf of this congregation, I am thrilled and honored to say: Welcome! Welcome to this church. Welcome to this community. Welcome to this beautifully imperfect, unapologetically authentic, grace-filled and abundantly blessed community of faith. I cannot wait to see what the future holds for all of us. One of my FAVORITE traditions – a letter to my confirmands on Confirmation Sunday. Enjoy! A few weeks ago, we gathered for our final confirmation dinner and class. One of our tasks that night was to plan worship for the following Sunday. This was not an easy class. You did not completely understand what I was asking you to do. I did not completely understand why you did not completely understand what I was asking you to do. You felt inadequate when it came to writing a prayer or choosing a scripture. I knew you could do it. Your voices were timid and you let the adult mentors speak when you were unsure of what to say yourself. I might have raised my voice once or twice and poured myself at least four cups of coffee throughout the night. Eventually we split you into groups and tasked you to write three prayers for that service without help from the mentors. I’ll be honest – as you began to talk amongst yourselves and I walked from group to group, I wasn’t really sure how it was going to go. You kept saying that you didn’t know where to start; that you didn’t know what to say; that you didn’t know the fancy church words to use. The paper in front of you remained blank and you all passed the pen or pencil around the group like a hot potato, hoping that someone else would start writing. But you didn’t give up. You put your heads together and you took it one word at a time. And when one group finished, that group moved to the other groups to see if they needed help. At the end of the night I sat around a long table with all 11 of you so we could edit the prayers together. As we did this, it was immediately clear to me that you WERE capable of writing these prayers (told you so), that you cared about what you had written and that you wanted them to be a reflection of what you believed. When you had no other choice, you found your voice. And guess what? This is faith – alive and at work. This is your faith. This is your faith growing and being nurtured. This is God speaking to you and shaping you into a unique member of the Body of Christ. This is you taking what you’ve learned over the past 14 or 15 years and finally realizing that you have an important voice in your faith, within this church and throughout the world. This is you finally embracing your beliefs; asking questions and not being complacent if you don’t like the answers. This day – Confirmation Sunday – is not just about the Christian faith – this day is about your faith. And as much as I want you to remember today, I think I almost want you to remember that last class more. Because I want you to remember that when you had no other choice, you found your voice. Next time I don’t want you to wait until you have no other choice. Because you had some pretty incredible things to say. I know that it isn’t always easy to talk about your faith, especially now. We live in a world where church and state are separate. You can’t talk about church at school. Only 10% of people in New England are part of some kind of a religious community, so a lot of your friends may not even understand what it means to be part of a church. And I’m not saying that this is a bad thing or a good thing, I’m just saying that this is the world that you live in. It is hard to let your faith voice be heard. You need to try 1) because you have some pretty incredible things to say and 2) because the world needs people like you, spreading the good news and sharing their faith. The world needs people like you, pushing yourselves outside of your comfort zone and encouraging others to do the same. The world needs people like you asking questions and not pretending to understand or believe something just because someone tells you to or expects you to. The world needs people who are willing to pray before community suppers, speak openly and honestly in a big group of people and serve the community whenever and wherever they are needed. “Do not let your hearts be troubled. Believe in God, believe also in me.” This is from today’s Gospel reading. Remember these words that Jesus spoke; know that you are never alone in this world. This church has some pretty spectacular Good News to share and today I am charging you to be part of the cloud of witnesses that is sharing it. So open yourselves up to see new things, hear new things, try new things and learn new things. Nurture your faith. Step outside of your comfort zone. Trust your instincts. And let your voice be heard. Let your voice be heard in this church, in this community and in the world. Let your voice be heard with your friends, at school and in your family. Let your voice be heard so that others can hear it, but – perhaps more importantly – let your voice be heard so that YOU can hear it as well. p.s. 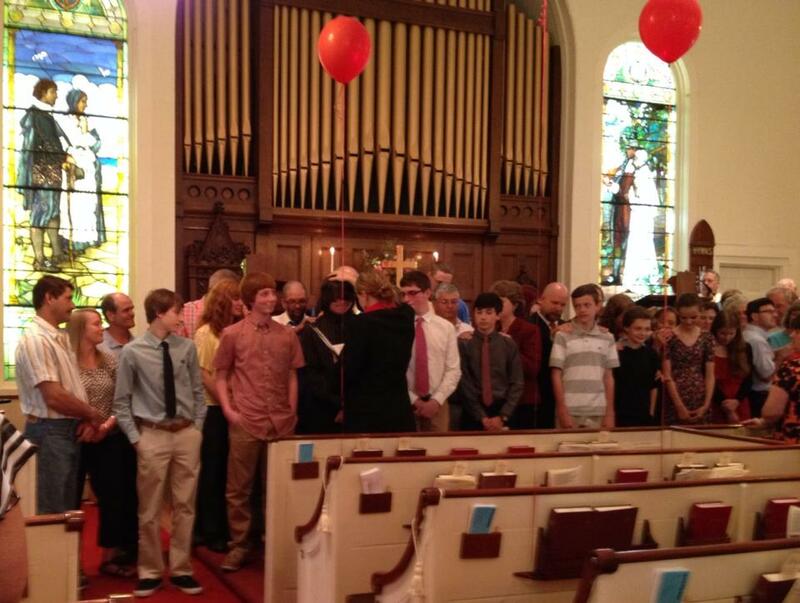 Getting confirmed does NOT mean that you stop coming to church. Let me repeat that. Getting confirmed does NOT mean that you stop coming to church. This is not the end of your faith story; this is the beginning of a new chapter.